Close to South Beach, yet far from its madding crowd, Thompson Miami Beach shines as a jewel of the design mecca where Art Deco meets mid-century and Miami Modern. The street art canvases of Wynwood Walls have transformed drab slabs of concrete into prismatic bursts of energy. And the Lincoln Road cafes and boutiques are never far away. A lush grove surrenders to glittering pools. An enigmatic bungalow houses a 1930s-era cocktail den. A high-energy ultra-lounge fuels the social scene. And a certain celebrity chef—the James Beard Foundation Award-winning Michelle Bernstein—is every bit as locally sourced as her cuisine. Featuring seven venues totaling over 47,000 square feet of indoor and outdoor event space and suites, Thompson Miami Beach is an ideal destination for inspiring events in upscale spaces. 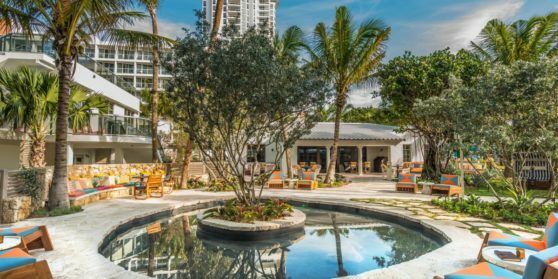 Discover lush, tropical gardens and lounges with ocean views, indoor/outdoor restaurants, two pools, a Library Bar and 1930s house; all featuring exclusive menus from award winning, local chef Michelle Bernstein. You and your group can also indulge in our spa, fitness center or 24-hour in-room dining room. Settle in. Relax by the pool. Swim a few laps. Take lunch in the garden. Now you’re ready for The Spa at Thompson Miami Beach — a rooftop, outdoor spa experience with a focus on body massage, aromatherapy, anti-aging and anti-oxidant skin care.